Women's World 10-Ball champ Rubilen Amit becomes the first woman in the pantheon of Philippine pool champions. UP UNTIL June 6, the proud and storied history of Philippine pool has included nary a woman. Not even close. That's because, unlike for the men, the culture of women's pool simply doesn't exist in the tropical archipelago. The many scruffy, back-alley poolhalls that attract poor guys looking to hustle a few bucks for food, and that serve as spawning grounds for the greats, are not the places Filipino women frequent, except perhaps as waitresses serving the guys. 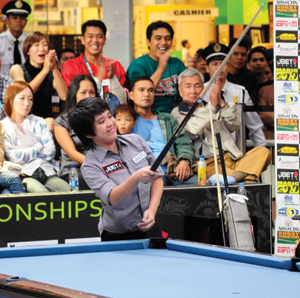 All that male-dominated history changed, however, on a memorable rainy Sunday afternoon inside a busy Manila shopping mall, when tiny Rubilen Amit, all 4 feet and 11 inches of her, shot her way to the first ever Women's World 10-Ball Championship title, defeating Taiwanese great Shin-Mei Liu in the finals, 10-4, in front of several thousand of her adoring countrymen and women, and millions more watching live around the nation. Now, when future pool historians look back on the game in the billiards hotbed of the Philippines, the pantheon of names like Reyes, Parica, Bustamante and Alcano will have to include Amit. "It's something new for pool in the Philippines," the friendly Amit said after her unlikely march to the title. "It's always been a male-dominated sport. I hope my win will pave the way for more women to take up the game." That could include girls like 11-year-old Filipina Gillian Go, who managed to qualify for the tournament and make it through to the knockout stage. No matter who they are, though, and whatever direction women's pool takes in the Philippines, Amit has now earned the lofty status of billiards pioneer. Fittingly, Amit's pedigree wasn't developed in smoky poolhalls playing money games. Since taking up the game as a teenager, she has always looked at pool as a sport rather than a way to make a living. "I've always been attracted to games where you put a ball in the hole. I tried basketball first, but my height was a problem," she said with a laugh. "Then I tried billiards and I loved it. I love the complexity of the game." The appreciation of the intricacies of pool led her to play regularly in college, and continued even as she tried her hand at business and the working world. "I tried working and I tried running a business," Amit said. "But the fulfillment I got from playing pool was different." So at 20 years old, despite the relative lack of precedent and obvious dearth of tournament opportunities for women, she decided pool would be her life's work. "I wanted to see what I could achieve. I dreamed of representing the country. And my dream was to win a world championship."